What mamu Aamir Khan can do, bhanja Imran Khan can aspire to copy. For starters, the boy’s taking his role as an actor just as seriously as Aamir does. So when producer Dhilin Mehta signed Imran for director Soham Shah’s action-adventure Luck opposite childhood friend Shruti Hassan, Imran decided to get into the skin of the character. For that, this is what he did: three months of strict dieting, body building, cable training, sky and deep-sea water diving, and more than that, preparing himself mentally to do dangerous stunts for the film. The film co-stars Sanjay Dutt, Mithun Chakraborthy, Danny Denzongpa and Ravi Kisshen. We are wondering why Sanju Baba allowed Imran to go ahead and do the shot without a double. 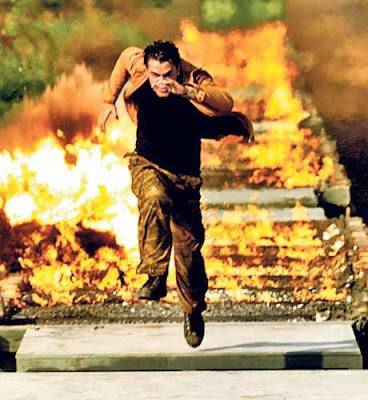 When they made Kidnap together, Dutt not only forbade the young actor for attempting stunts himself, but also called Aamir and gave the mamu a piece of his mind.